As you make-up diehards may know, Nov 11-15, Sephora gave a 20% discount to their VIB customers. I went to the first night of the 'sale' for their shopping event. I'll be honest, since I'm broke, it was mostly to get the freebies, but when I saw this polish, I totally couldn't resist it, and at 20% off, what better time?! The color I'm talking about is part of their Holiday collection, and it's called 212 Sephora, which is a soft black with iridescent glitter, as well as gold glitter, and copper flakies!! It's seriously AMAZING. For today's design, I really wanted to use it, but I didn't want to cover it up, so I chose to do a simple burst in an olive color in the upper corner of the nail. I used OPI for Sephora 212 Sephora as a base, with Rescue Beauty No More War for the burst. Topped it all off with 2 coats of Seche Vite top coat. The manicure is hot...can we get a tutorial please??? It looks like pot leaves! 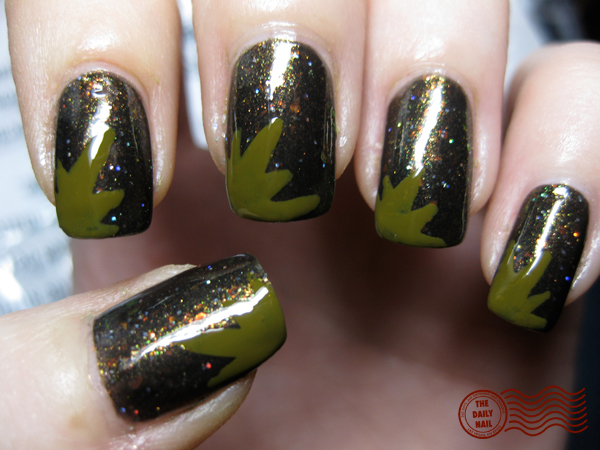 :P Reminds me of the weeds mani! I bought this color in Times Square when I was in NYC... its a really great shade, isn't it!? love it! and that 212 is one of my all time favorite polishes ever! Anonymous beat me to it. The "olive bursts" totally look like cannabis leaves. That is awesome. gosh i need that sephora by opi polish. it's gorgeous! I snatched that up during friends & family, wasn't sure about it, but wow it looks awesome! Thanks for posting it! OMG! I, too am feelin' the recession, and didn't get to spend what I wanted to (harumph) at Sephora's F N'F event. But what I DID get was $OPI 212! I've lemming'd it for so long, I convinced myself that 20% off was the omen that I should own it. 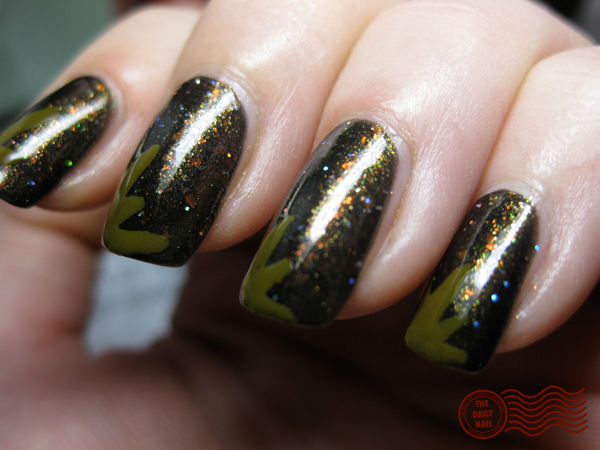 It is gorgeous- I was so excited to see this on your nails! I knew immediately what it was. You so totally rock!